What is Next Steps Survey? You may just be exploring Christ right now. In fact, you may be taking this survey to find out how to start your relationship with Christ. If you have not taken the first step of accepting Christ as your Lord and Savior, then that is your next step. It is a simple one. Click here for more information. No matter where you are in your walk with Christ, each of us needs regular spiritual checkups; an accurate assessment that serves as a progress report that helps us see exactly where we are in our process of becoming like Christ. Once we know where we are, all we need is a clear goal and a next step and we can continue our journey of growing in the Lord. 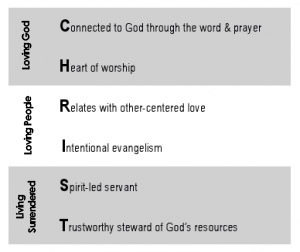 We have created this tool, based on the Core CHRIST-like Characteristics, to help you ?test yourself? in order to accurately discern your current spiritual health. This helps us obey what Paul talked about in 2 Corinthians 13:5. Think of it as a spiritual health check-up. Fortunately, this checkup won?t take near as long (10 minutes) as going to your doctor and it won?t involve any physical pain. When you are done with the survey, we will provide you with some clear action steps and activities to encourage growth based upon your results. Spiritual growth is not a one size fits all approach. What got you to your current state of health may not be what brings you to maturity. You’re taking this survey because you want to grow in the Lord and this instrument is only as valuable as your openness and honesty. So please, take a moment to stop right now and pray and ask God to give you clarity, courage and discernment.